This paper was developed out of a course that Kari and Whitney were taking. It was their first research practicum course in the PhD program at The University of Texas at Austin. They were both fulfilling lab hours on Dr. Rew’s project. 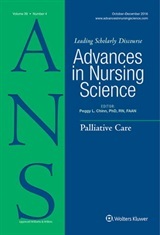 Dr. Rew regularly reads Advances in Nursing Science (ANS) and was aware that it was nearly time for their next “critique and replication” issue. An upcoming issue was going to be on replication and critique of articles that had previously been published in ANS. So what we wanted to do was to look through the entire history of this particular journal to see what had been written about sexual health and sexual rights. That was our starting point. So, we decided that we would do a modified systematic review of the literature and the modification was that we were going to use just ANS to search for articles on these topics. It took a lot of revisions and hard work but it was a fun process to go through and refine the search terms. We discovered various ways that sexuality had been addressed among our sample of articles, but not necessarily sexual health or sexual rights. We also discovered the impact of policy as well as theoretical perspectives and frameworks that were used or not used. One of our surprising findings was that nursing theory wasn’t addressed very much at all. This surprised us because we thought that out of all nursing journals, Advances in Nursing Science would have something about nursing theory and sexuality. So, when we wrote in the paper that we wanted to encourage other authors to write about these topics, we really meant it. Our discovery and recommendation were based on actual data. Although the finding surprised us, it was also somewhat exciting to discover that there is a larger realm of work that still needs to be done to address the gap on this topic, especially for new nurse researchers. This is an example of one way that PhD students can gain experience in publishing their ideas and aid in building their Curriculum Vitae. We were fortunate that all three of us were interested in the topic and in the “expected” outcome. We hope to encourage many other investigators, students and faculty alike, to explore the phenomena of sexual health and sexual rights. In the pictures, from left to right, are Kari, Lynn, and Whitney. The emancipatory way of knowing is most appropriate to undergird any theories of sexual ‘rights’ in nursing. Most nursing grand and many middle range theories written by white middle class heterosexual academic women. Unlikely they included the questions and barriers faced by sexual and racial ‘minorities’.